Learn how to configure the default Desktop coupon popup and success bar! When one of your Trigger's conditions is reached on a Desktop or Tablet device in landscape view, Coupon Countdown will generate a popup offering a unique one-time-use coupon code along with a discount lifetime countdown timer. When a visitor clicks the popup to claim the coupon, a success bar will then appear at the right-hand-side of the screen. The default appearance and functionality for the coupon popup and success bar can be configured at Settings > Desktop. Note: You will have the option of using a "Custom" popup and success bar for each Trigger that you setup as well. 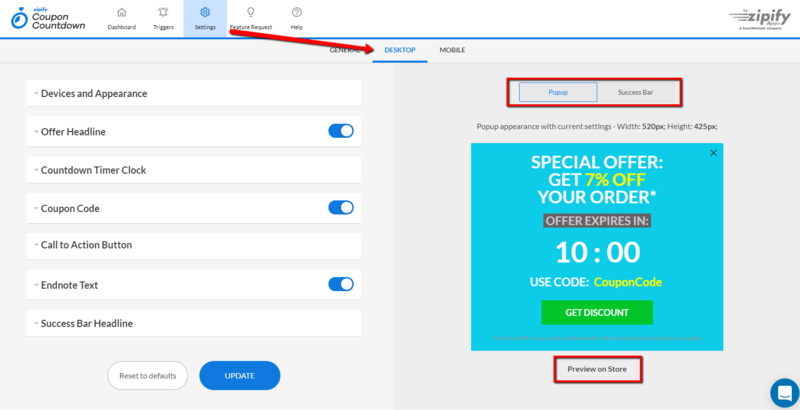 Here is where you configure all of the settings for the coupon popup and success bar. There are also "Preview" buttons available for each so you can see how they will look on your store. As you make edits to the appearance, the edits will show in real-time within the editing window. Note: The Previews will not function correctly, they are for testing the appearance only. The width and height of the popup is provided so that you can choose a popup background image according to a given size. The max file size supported is 100 mb. All images more than 1080p are resized to 1080p after uploading. Popup screen location - Set where on the screen you want the popup to show on Desktop by choosing a point on the grid. The bar location on the mobile version does not change. Popup size - Choose one of the predefined settings of the horizontal size of the popup: S 380px, M 450px, L 520px. Popup background color - Select a background color for your popup. Popup background image - To enable this setting, turn on the switch and click the "Upload Image" button to choose an image you like from your computer. It is not recommended to use images larger than 1080 px. Close Button Color - Select a color for the Close button (the X in the top right corner of the popup). To save all the changes applied, click Update button at the bottom of the screen. This block allows you to configure the timer’s appearance by choosing a font style, a font size, a font family and a color. Edit the coupon code information displayed for the popup. Configure the appearance of the "Get Discount" button by specifying its color, size, border corners and a button text format. Edit the text that displays at the very bottom of the coupon popup. Edit the discount confirmation text shown in the bar which appears at the right-hand-side of the screen after a visitor clicks the "Get Discount" Call to Action Button. Offer Headline, Coupon Code and Endnote Text are not mandatory and can be turned off by using the switchers.